Bullo Pill, on the Severn near Newnham, originally a small tidal creek off the main river used for boat building, was developed by building a dock basin with lock gates, and wharfs for loading goods for shipment. Coal and stone from the Forest could be loaded at the dock and exported on the Severn trows up or down the river. In addition, there was a flow of barges carrying coal across the river to Framilode and then along the Stroudwater Canal to Brimscombe, Stroud and Chalford. The name ‘Bullo Pill’ is unusual. ‘Pill’ is a local word meaning a tidal inlet. The Oxford English Dictionary gives the etymology as Old English (Anglo Saxon) – but some internet sources state it to be Welsh or Irish. A private railway (a tramway/tramroad) was built from Bullo Pill via Soudley and Ruspidge to Churchway near Cinderford Bridge in 1807, a distance of nearly four and a half miles; when it was nearly complete, the Bullo Pill Railway Company applied for an Act of Parliament in order to extend the railway a further two miles to the summit of the hill above Churchway Engine, and to make branches. The Royal Assent to the Act was made on 10 June 1809. The railway was of approximately 4 ft gauge, laid as a plateway, with rails of L-shaped section, spiked to stone blocks. Rails were supplied by the Ayleford Foundry, near Soudley; a branch line was constructed from the foundry. All traffic was horse-drawn, using privately owned four-wheeled wagons of an approved type, with an oak underframe supporting a hopper-shaped body, and with un-flanged cast-iron wheels. The line was single, with frequent passing loops. By 5th May 1826, the Forest of Dean Railway Company had taken over the Bullo Pill Tramway. An Act of Parliament was passed to establish the Forest of Dean Railway Company. In some places the tramway was built over. In others, the railway took a different route. In 1852, the Forest of Dean Railway was acquired by the South Wales Railway. Details of The Forest of Dean Railway Company and its railway can be found on a variety of internet sites. There were a series of branch-lines as far north as St. Annals to the east and Crump Meadow to the west. On the Bullo Pill dockside, at SO 6907 0981, there is a pile of stone blocks, some with a single drilled hole. These may well be original tramroad blocks. The dock at Bullo Pill became inadequate for the level of traffic by the 1830s, so a wharf was built at Box Meadow. 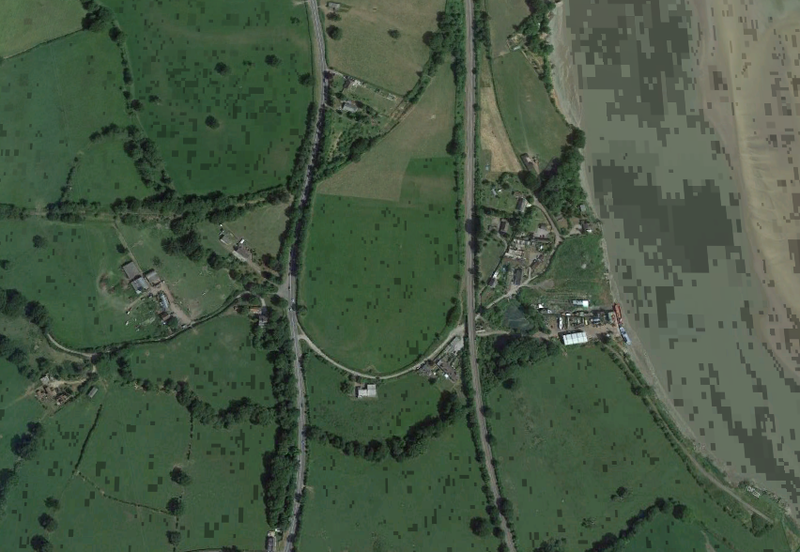 The tramway, which is now a track, ran south from the dock at Bullo Pill to the wharf and can be see alongside the Severn estuary to the right of the Google Earth satellite image above. The watermarked map above is an excerpt from the 1881 1:2500 OS County Series and clearly shows the location of the wharf in relation to the Pill. The map is sourced from the http://old-maps.co.uk website. The old tramway is clearly visible at Bullo Pill and at the wharf and was still in use within the site. It is also seen travelling north towards Bullo Pill Station which is north of the railway junction. From Bullo Pill the tramway ran west and crossed what is now the main A48 road at quite an angle and at grade. It passed a building now in private ownership which was formerly a public house and before that a tramway building. The route is visible as a curved track on the above map and satellite image to the West of the main railway line between Gloucester and Chepstow. Beyond the A48, the tramway route is crossed by the later Forest of Dean Railway embankment. The railway is also now abandoned, but its path and that of the tramway are approximately coterminous as they approach Haie Hill Tunnel, sometimes known as Bullo Pill Tunnel. Some images of the railway line and the enlarged tunnel required for it are shown below. Other images can be found on Flickr. Interestingly the tunnel was, when built in 1810, the longest in the world! 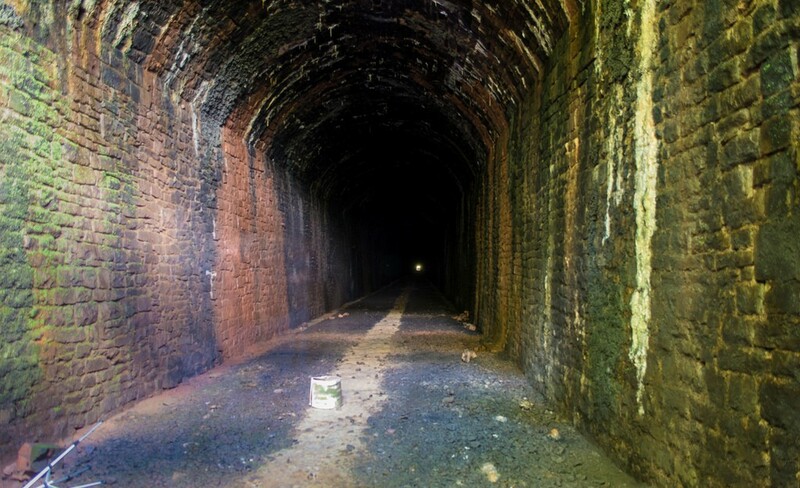 It was 1,083 yards long and remains the oldest tunnel ever to used by passenger carrying trains. From Bullo Pill, the distance to the entrance of Haie Hill Tunnel was approximately a mile. The present (early 21st Century) state of the enlarged tunnel bore can be seen on the above photos which show, in order, the approach from Bullo Pill, a closer shot of the tunnel portal and then the northern portal. [10a] The children of Bullo Pill used the tunnel to reach their school at Soudley, having to time their walks so as not to meet any trains. To reach the tunnel, the tramway needed shallower grades than the later railway and its route can be picked out on the plan above. It took a more circuitous route than the later railway needing a loop to the north and then to the south side of the railway to allow it to gain enough height. The shallower grades permitted the horses to pull a reasonable number of wagons. The following image is of the railway, rather than the tramway, and comes from a short post on www.forgottenrelics.co.uk by a former loco fireman, Bob Barnett. 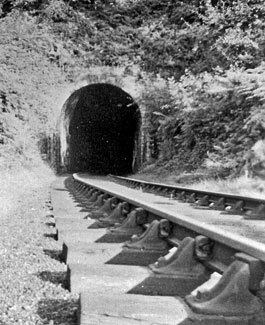 It shows the approach to the tunnel while it was still in use. The engineer for the tunnel construction was John Hodgekinson and the Contractor was Robert Tipping. The Eastern portal, closest to Bullo Pill, stood at the end of a stonewalled cutting which is overgrown and obscured by vegetation. The portal has been partly bricked up, an opening has been left at the top to allow bats to enter and roost and a low-level access hatch has been provided to allow human access. Inside, the bore is tidy and mostly dry (see the image below). The tunnel was enlarged for broad gauge by Isambard Kingdom Brunel in The tunnel climbs at a steep rising gradient of 1:56 in the westward direction. It could take a train of empty wagons five minutes to pass through. Although mostly straight, a slight curve to the north is encountered at the west end. The masonry lining features an arched roof with vertical side walls into which generous refuges are provided at regular intervals, some with exposed rock at their rear. Signalling pulleys and cable hangers remain in situ on the south wall. Near its centre, a rare milepost remains. A drain runs down the tunnel’s centre line – accessed via numerous small catchpits – and many weep holes have been cut into the lining, resulting in some significant accumulations of calcite on both walls. At the west portal, which is also bricked-up, a stream runs in a channel beneath the bore. 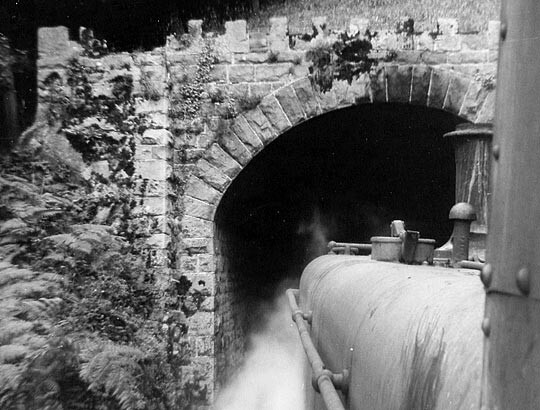 The Western portal is near the village of Soudley but separated from it by another short tunnel – Bradley Hill Tunnel. Close to the Western portal of Haie Hill Tunnel a tramway branch ran south to the site of a forge/foundry at Bradley House. The railway track is now a footpath. From the tunnel portal the railway headed north-west across the Soudley Brook through Bradley Hill Tunnel to Soudley Crossing. “The tramroad circuitously headed north along the modern tarmac lane past Furnace Crossing to join the B4227 by the bridge at SO 6649 1041, thence following the modern road north then west past Camp Mill, now the Dean Forest Heritage Centre, to re-join the railway at Soudley Crossing, SO 6610 1050.” The satellite image above shows the area at the western portal of Haie Hill Tunnel, Bradley Hill Tunnel and at the western edge of the satellite image, the formation of the old railway emerging to the west of Bradley Hill Tunnel. The tramway followed what is now the road to the north of the hill running past the Dean Heritage Centre which is at the top of the image. From this point, the railway track-bed and the road run in parallel, westwards towards the White Horse Inn. Just to the south of the railway is a track, known locally as ‘The Dram’. 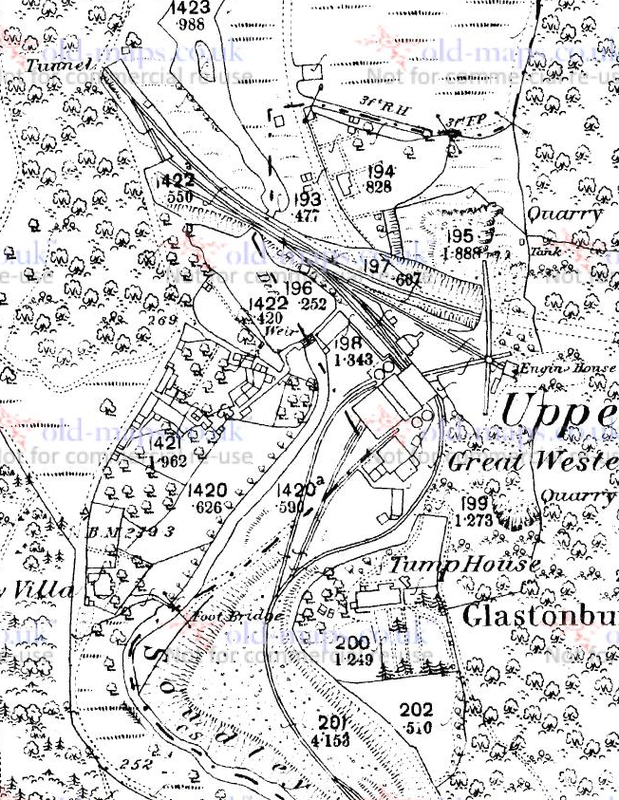 The pub is not shown on the 1881 Ordinance Survey map below but is at the site of the Old Quarry. The Dram still has tramway track shown on it in the OS Map below. At the White Horse Inn/Old Quarry the track-bed of the tramway appears to divert south from the railway. Its presumed route is shown as a red line on the next OS Map excerpt below from 1881. At the point where the tramroad heads sharply north, there was a short branch which crossed the river to serve Flindall Ironworks which were already disused at the time of the 1881 Ordnance Survey. 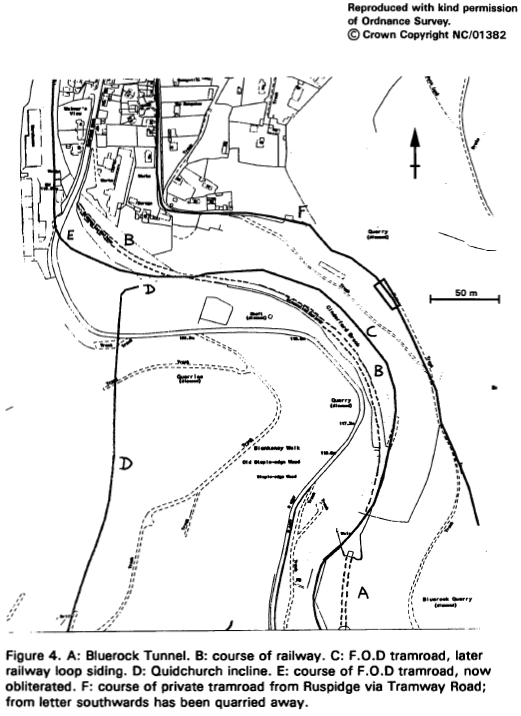 It is then assumed that the tramway formation is hidden under the railway formation travelling north from Upper Soudley towards Shakemantle and Perseverance Mines. This next extract (above) from the OS Map of 1881 shows these two mines as well as the short Blue Rock Tunnel (at the very bottom of the excerpt). 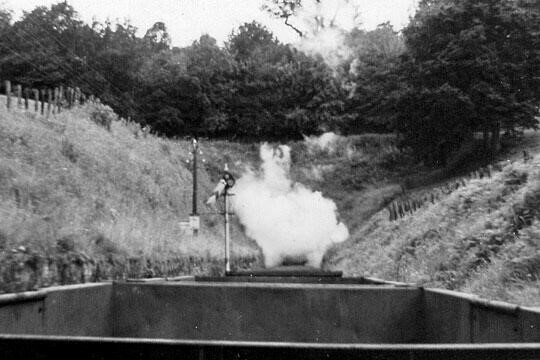 This tunnel is shown in the photograph below that map – a picture taken from the cab of a pannier tank locomotive. Blue Rock Tunnel was built for the railway, the tramway skirted the rocky promontory, following the course of the river and re-joined the railway track-bed immediately north of the Tunnel. A few metres further north the main railway line curved to the West and a branch-line provided access to Shakemantle Mine. That line was built over the route of the tramway which passed close to the limekilns shown at the centre of the map above. 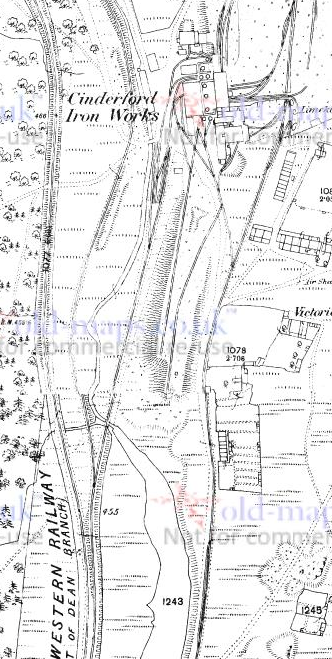 One source suggests that the tramway formation turned west and crossed the railway line close to the interchange with Quidchurch Colliery tramroad incline at SO 6551 1128. 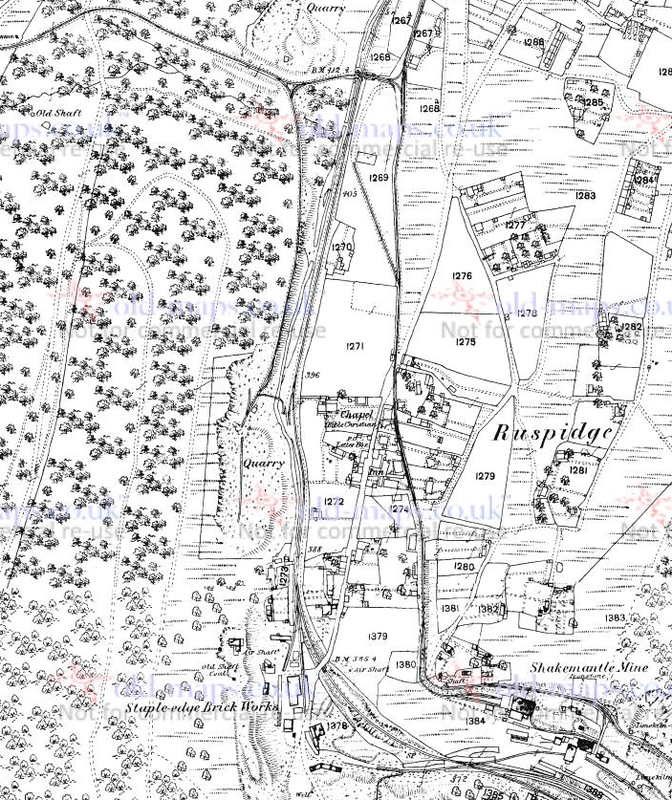 However, as the next excerpt from the 1881 Ordnance Survery shows, there was clearly a tramway running north from Shakemantle Quarry and through the village of Ruspidge. 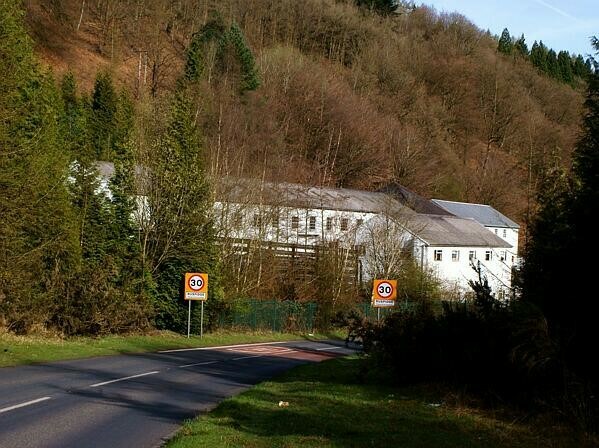 It is possible that the route suggested by Youles is actually a branch serving the Quidchurch Mine. Although the visible line on the 1881 map appears to be higher on the contours of the valley side than might have been feasible for the tramway mainline. Youles seems to refer to this line as a private tramway. If Youles is right, then we need to acknowledge an alternative route for the tramway which probably followed the railway formation. He says, “the Quidchurch interchange site is now thickly wooded, but the course of the railway siding which it shared with Perseverance Ironstone Mine, can still be seen, as can the earthwork remains of the interchange wharf. A GWR boundary marker situated between the siding and the railway, confirms that the siding was a private one. 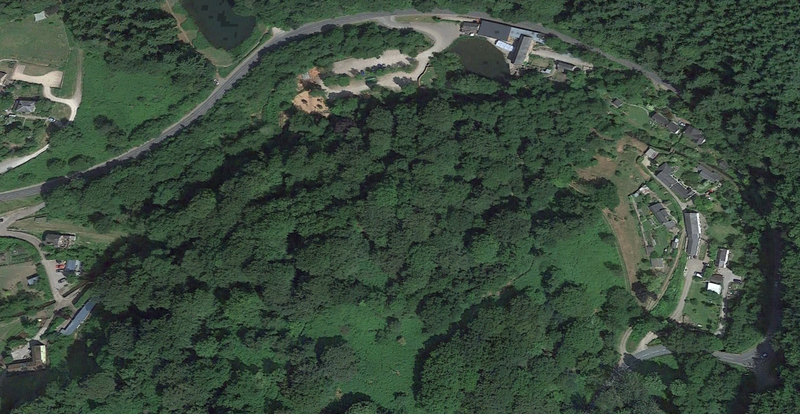 From here the tramroad incline ran south to cross the Soudley to Ruspidge road before climbing the steep slopes of Staple Edge Wood en-route for Quidchurch.” The incline to Quidchurch headed towards the bald area shown on the bottom left of the satellite image above. Youles goes on to say that the earthworks associated with the former Eastern United Colliery have obliterated all traces of the tramways in this area. The Eastern United Colliery was built over the site of the Staple-edge Brick Works and itself closed in 1959. All that is left in the early 21st Century are the colliery office and the power house. Eastern United was a drift colliery, dug into the side of the hill, but it did have a shaft. 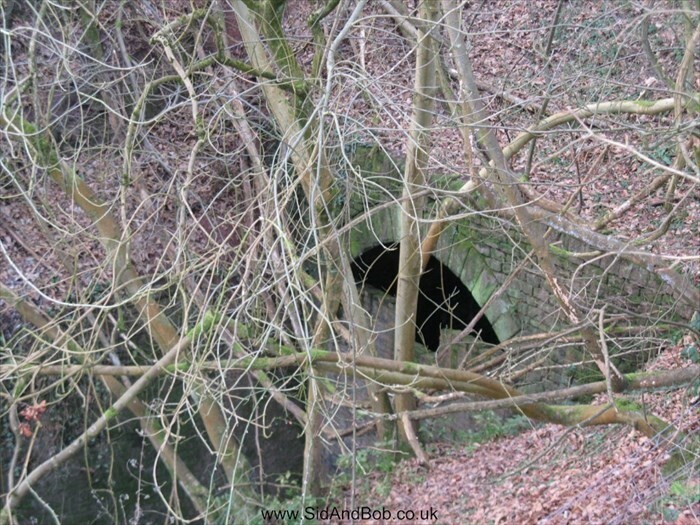 It was a ventilation shaft, Findall later known as Walmers shaft, hill on the hill above the colliery. The buildings are currently in use as a factory making dyes and colourants for paint. 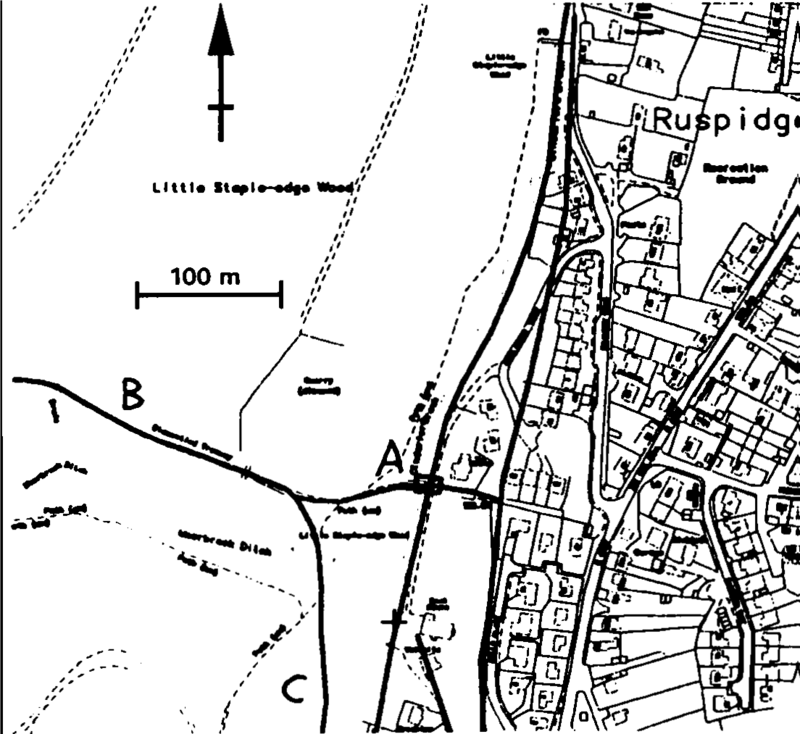 On the map above, a tramway can be seen running north through Ruspidge. 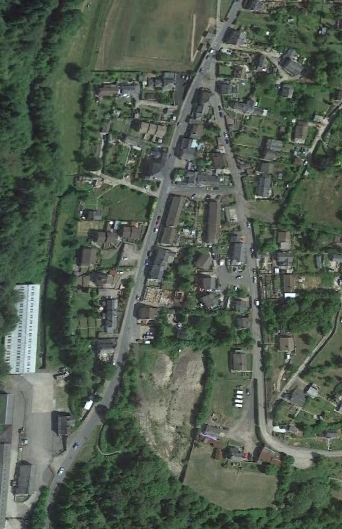 It is shown on the satellite image to the right as a tarmacked road which meets the main road north of the site of the Eastern United Colliery. That ‘private’ tramway continued north of the main road to a junction with a tramway which ran East-West (crossing the line of the railway and serving Lightmoor Colliery to the West. 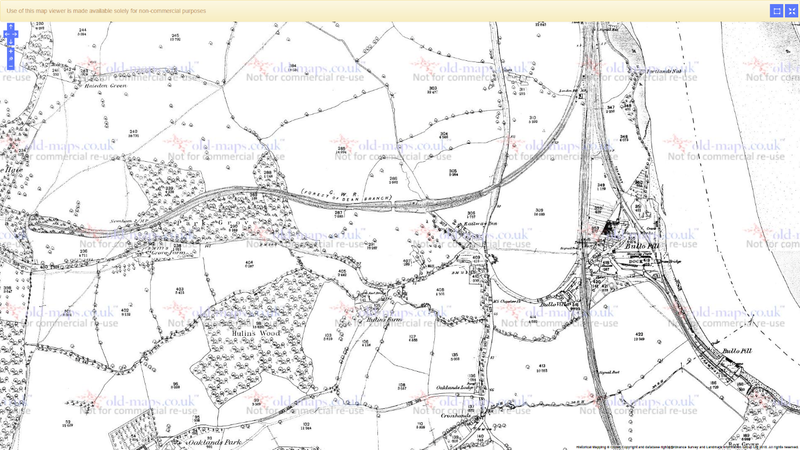 This is illustrated in the next smaller map which shows Lightmoor Colliery in the West. Another tramway is shown serving a quarry adjacent to Cinderford Brook which connects to the East-West tramway. North of the branch to the Lightmoor Colliery, the tramroad formation and the railway formation converge alongside Cinderford Brook. The spoil heap from Eastern United Colliery buried the route of the Forest of Dean Tramroad. It appears (Figure 4) that the route ran west from the interchange wharf, then turned north to rejoin the railway formation at the Eastern United site. In this case, the tramway ran parallel to both the ones already mentioned. The site of Eastern United Colliery is shown in the photo below. The railway formation overlies the tramway formation from this point to Cullamore Bridge. Cullamore Bridge (A) carried the tramroad from Lightmoor Colliery over the Cinderford Brook and the Forest of Dean Tramroad to a junction with the private Ruspidge to Shakemantle Tramroad. The Lightmoor Colliery Tramroad formation can still be accessed on foot. We have already noted the tramroad serving the quarry (C). The tramway link into Lightmoor (B) ascends the hillside through a cutting, on the sides of which are the remains of bridge abutments; the bridge led to the quarry’s spoil heap on the other side of the tramroad. After a few more metres, a path trails off to the south, following the line of another tramroad to Staple Edge Quarry. The Lightmoor track continues west to the colliery site, now an open-cast operation, where stands a large derelict and roofless building. About 200 metres north of Cullamore, near the foot of the modern Railway Road, the private Ruspidge – Shakemantle tramroad trailed in. From the junction it ran almost due south, gradually diverging from the mainline, and climbing, to cross the Ruspidge Road at SO 6500 1169 where the Bible Christian Chapel (now a studio) stands. The first part of this section remains as a track and private drive, but from the chapel it continues, still climbing, as Tramway Road, to end at SO 6525 1133 high on the hillside overlooking the site of Shakemantle iron mine and adjacent to the extensive abandoned quarry workings. From the junction near Cullamore the mainline tramroad diverged from the railway, following the modern lower Railway Road, crossing the B4226 and reaching Valley Road via the passage between the Bridge Inn and the adjoining building. From here to its terminus at Churchway, few traces of the mainline tramroad remain, although much of the route can be followed using later roads and a few tracks, as far as the site of the Cinderford Ironworks. 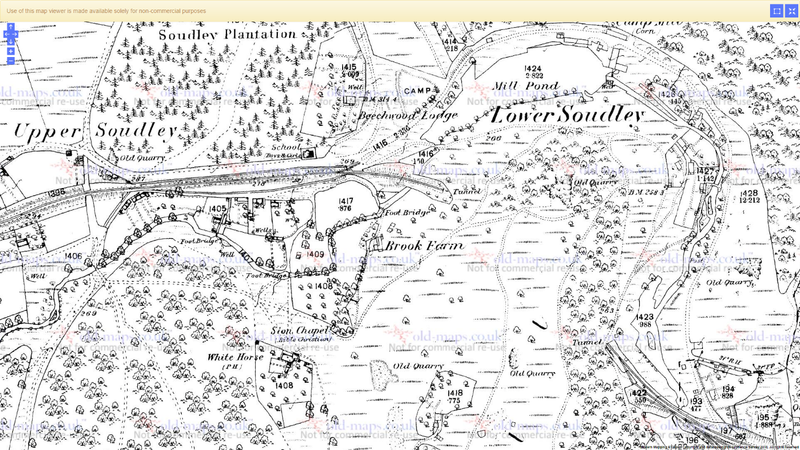 The next map below shows the Ironworks. 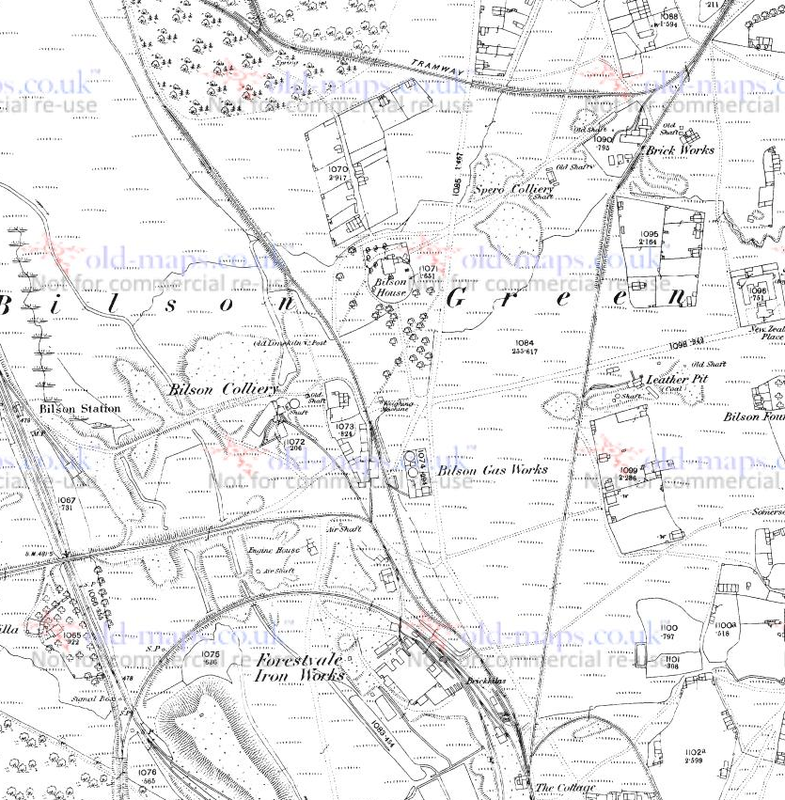 The 1881 Ordnance Survey shows much of the detail of the tramway which enters centre right at the bottom of the map and runs north past a series of cottages before serving the Ironworks. 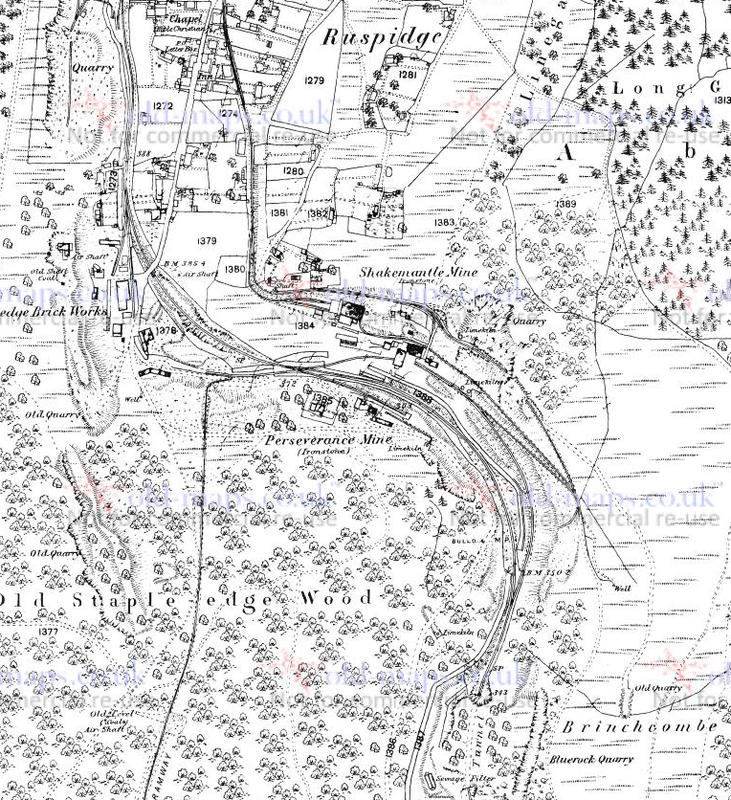 On the 1881 Map, the Forest of Dean Branch (standard gauge) Line can be seen entering the map on the bottom left. 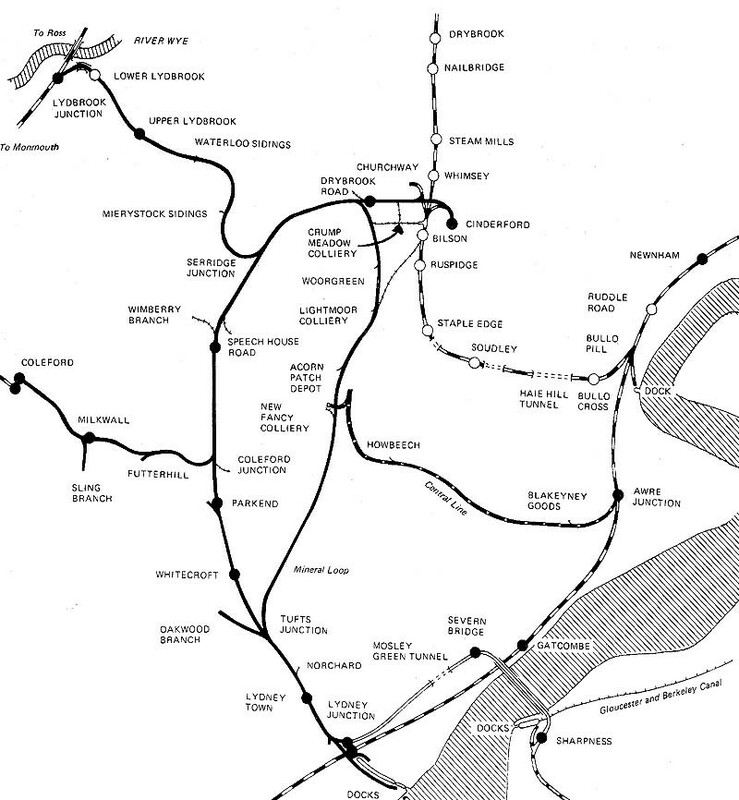 Two lines are present, the most Westerly is the main line and the branch (to the East of the main line) serves the Ironworks and splits to provide separate access to the Works and its spoil heap. The main line of the Forest of Dean Branch leaves the map on the top right. The Buckshaft Branch Tramway 1881 Ordnance Survey (Not to Scale). Just north of Cinderford Iron Works, the Buckshaft and St. Annals branch tramroads diverged, and these also can be followed for much of the way, but as routes only, physical traces being virtually nonexistent. The 1881 Survey shows the Buckshaft line clearly on the maps immediately below. The satellite image from the early 21st Century shows the line of the Buckshaft branch among all the modern housing and industry. 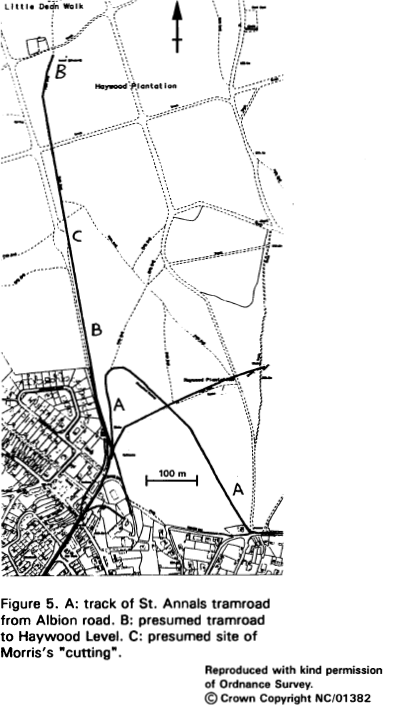 The Annals Branch Tramway 1881 Ordnance Survey (Not to Scale). The St. Annals branch crossed Cinderford Lower High Street at SO 6549 1457 and followed Albion Road to enter Haywood Plantation. At the road’s end, three paths are seen. The centre one follows the branch route. It slopes up quite steeply to SO 6564 1500, where it curves sharply south west through 160 degrees to reach the edge of the plantation at Causeway Road, which it follows to the mine site, the last few hundred metres being an overgrown track to the south of, and parallel to, the road. The St. Annals tramway appears as one of a myriad of different tramways north of Cinderford Ironworks on the 1881 Survey. It leaves the map of the Buckshaft Branch below at the top of the first panel of the maps below above ‘The Cottage’. It travels just to the East of North in a straight line for some distance, past Bilson Gas Works and a Leather Works before deviating North-North-East close to Spero Colliery and being joined by another tramroad from the West. The St. Annals tramway continues North-North-East to run trough a small complex of sidings close to Seven Stars Inn which served Haywood Colliery. After this the tramway turned northwards for a short distance before swinging sharply round to a South-Easterly direction to head for St. Annals Ironstone Mine which was close to Latimore’s Lodge. The Annals Branch Tramroad (A) sustained a short branch of its own which accessed Haywood Level (B) – see Figure 5 above. Returning now to Cinderford and Forestvale Ironworks, three significant tramway routes still have to be explored. We will leave these for a future blog. https://www.revolvy.com/main/index.php?s=Bullo%20Pill%20Railway, accessed 11th March 2018. Shorter Oxford English Dictionary: Pill [OE pyll, var of pull, pul pool, creek] A local name on both sides of the Bristol Channel, in Cornwall etc., for a tidal creek on the coast, or a pool in a creek etc. http://www.waymarking.com/waymarks/WM60XN_Haie_Hill_Bullo_Pill_Tunnel_Forest_of_Dean_UK, accessed 11th March 2018. 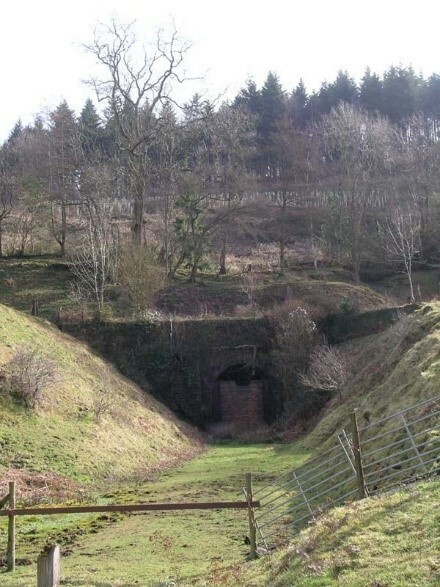 For example: https://www.gracesguide.co.uk/Forest_of_Dean_Railway, accessed on 11th March 2018, https://en.wikipedia.org/wiki/Forest_of_Dean_Railway, accessed 10th March 2018.
 https://www.gsia.org.uk/reprints/2000/gi200019.pdf, accessed 23rd February 2018; R. J. Morris, The Forest of Dean Tramroad, Coleford, 1997. R. J. Morris, The Forest of Dean Tramroad, Coleford, 1997, p16. 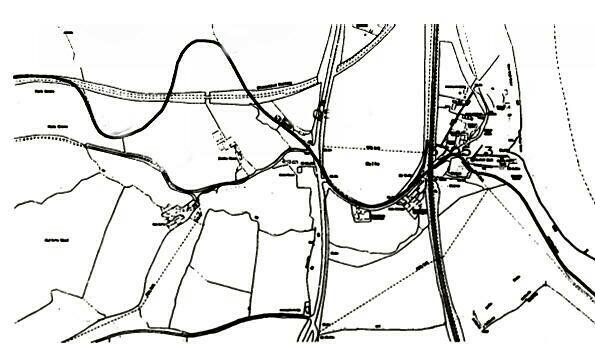 https://www.old-maps.co.uk/#/Map/365500/213500/12/100203, accessed 11th March 2018.
 https://www.gracesguide.co.uk/Forest_of_Dean_Railway, accessed 11th March 2018.
 https://www.flickr.com/photos/midlandexplorerboy/sets/72157624265737465, accessed 11th March 2018.
 http://www.waymarking.com/waymarks/WM60XN_Haie_Hill_Bullo_Pill_Tunnel_Forest_of_Dean_UK, accessed on 11th March 2018; Humphrey Household, Gloucestershire Railways in the Twenties. Alan Sutton Publishing Limited, Gloucester, 1984; Rex Christiansen, A Regional History of the Railways of Great Britain: Volume 13: Thames and Severn, David & Charles, Newton Abbot, 1981; Colin G. Maggs, The Branch Lines of Gloucestershire, Amberley Publishing, Stroud, 2009. 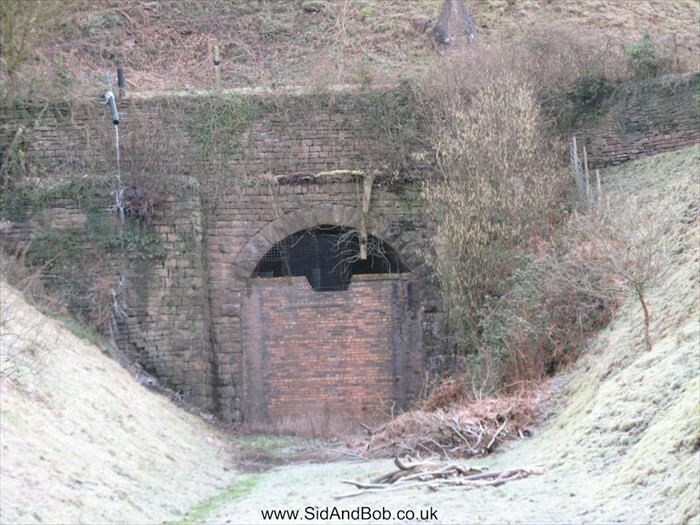 [10a] http://www.sidandbob.co.uk, accessed 9th March 2018.
 http://www.deanweb.info/history2.html, accessed 11th March 2018.
 http://www.forgottenrelics.co.uk/tunnels/bradleyhill.html, accessed 10th March 2018.
 https://www.gracesguide.co.uk/Haie_Hill_Tunnel, accessed 11th March 2018.
 http://news.bbc.co.uk/local/gloucestershire/hi/people_and_places/history/newsid_8255000/8255346.stm, accessed 12th March 2018.
 http://www.forgottenrelics.co.uk/tunnels/gallery/haiehill.html, accessed 11th March 2018. Ayleford Forge (Morris op.cit., p.16); Bradley Foundry. Tony Youles, Tramroad Remains in the Forest of Dean, Gloucestershire Society for Industrial Archaeology Journal, 2000, p20. Tony Youles, Tramroad Remains in the Forest of Dean, Gloucestershire Society for Industrial Archaeology Journal, 2000, p25. Tony Youles, Tramroad Remains in the Forest of Dean, Gloucestershire Society for Industrial Archaeology Journal, 2000, p21. Youles, op. cit., p21, comments: Morris implies that the tramroad line descending via Tramway Road was the mainline, rather than the private branch recorded by the Sites and Monuments Record (SMR) department of Gloucestershire County Council. See the captions to plates 6 and 7 in his book, and the Ruspidge paragraph on page 48. This route seems unlikely, since the mainline would have to climb from near the north portal of Bluerock tunnel, just above the level of the Cinderford Brook, to high on the hillside above (as shown in Morris’s plate 6 upper left) only to take the long descent to regain the level of the brook just north of Cullamore. The route shown on the SMR map, which follows the valley floor, is taken from an 1856 Board of Guardians map which shows the then recently completed railway and vestigial sections of the mainline tramroad not directly overbuilt by the railway, including that part later overlaid by the railway’s Shakemantle siding. Also shown is the private tramroad from near Cullamore Bridge, running south via Tramway Road to its terminus on the hillside high above Shakemantle, the railway and the mainline of the Forest of Dean tramroad. Tony Youles, Tramroad Remains in the Forest of Dean, Gloucestershire Society for Industrial Archaeology Journal, 2000, p22-29. This entry was posted in Forest of Dean, Railways Blog on March 13, 2018 by rogerfarnworth. Much enjoyed coming across your detailed description. I had been working my way through old maps and other books trying to pull all the sections together for myself. Thank you. The old tramways and railways of the Forest are really interesting.